The challenge of working belowground, on the least understood portion of tropical forests, has been met by increasing numbers of studies over the last 25 years. 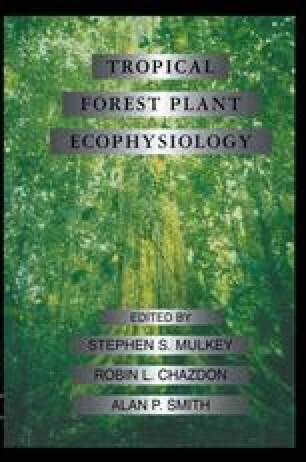 For many basic questions concerning root physiology, however, only preliminary observations have been made, often in only one forest type or within a single species. In contrast to aboveground portions of tropical trees, roots are only beginning to be examined. Fine roots have been measured in numerous ways in recent years, yet large roots (sometimes called coarse roots) have been largely ignored. This situation is analogous to extensive studies of leaf activity without corollary studies of stem growth and respiration. A bottom-up physiological approach, synthesizing results of detailed studies of tropical tree roots, is not yet possible. Nevertheless, sufficient information is available to indicate trends in biomass and fine root allocation patterns for some tropical forests types in relation to either water and/or nutrient availability. Separating fine and coarse roots into discreet categories is a convenient methodological tool, especially in the measurement of biomass (Bohn, 1979), however, such dichotomies tend to disperse the focus that should be oriented toward whole-plant strategies.Likewise, the separation of tropical roots into descriptive morphological categories (Jenik, 1971) has allowed temperate zone-trained biologists to contend with the diversity of root forms in tropical forests, but has not provided a useful format for asking physiological questions.